The socio-economic situation of the Arab-Bedouin population in the Negev is examined in light of the general Israeli Arab population. 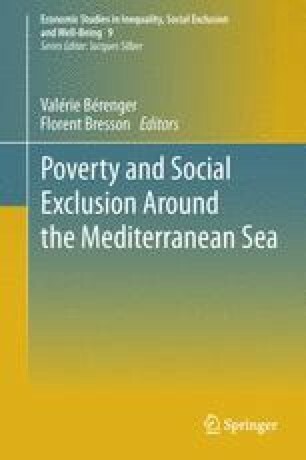 Based on the Galilee Society’s social survey for 2004 Israeli Arab poverty incidence was found to be 52 % with nearly two-thirds in persistent poverty. Among Bedouins living in villages unrecognized by the Israeli government poverty incidence was nearly 80 %, and poverty severity, as measured by the Sen-Poverty index, was as high as seven times than that among the mainstream population in Israel, i.e., the Jewish population (excluding the—predominantly poor—ultra orthodox Jews). Similarly to international evidence, we found that education, age, family size, employment, and occupation of the household head and the number of income earners in the family are important determinants of the probability of being poor. We show that the rapid increase of Arab women’s student enrollment rates not only reduced the education gap compared to Arab men but importantly adds to poverty reduction through various channels. Bedouin households, especially in the unrecognized villages, were found to have much less access to infrastructure compared to other Arabs, thus implying that the lack in infrastructure forms a significant barrier to women’s participation in the labor force. This was also found to have an adverse indirect effect on the completion of schooling, and indirectly on mothers’ fertility, keeping it relatively high by reducing education’s potentially diminishing effect on poverty. A considerable mismatch between skills and employment was found among Arab academics, thus pointing at the possibility of discrimination and segregation in the relevant labor market. Considering various transmission mechanisms, we show that government intervention in infrastructure has a high expected social return, both through direct and indirect channels and could, thus, help in interrupting the vicious circle of poverty. The Hebrew version of the paper was written for the program “Economics and Society” headed by Professor Arie Arnon at the Van Leer Institute and financed by the National Insurance Institute Research Fund. Special thanks to Alex Fruman for excellent research assistance and Sarah Gargi for preparing the English version for publication. We thank Ismael Abu-S’aad, Aamer El-Huzayel, and Aamer Abu-Qarn, Valérie Bérenger, Florent Bresson, Ramsis Gera, Jacques Silber, and an anonymous referee for useful comments. Opinions expressed are of the authors and should not be attributed to any of the mentioned institutions. Gottlieb, D. (2007). “Poverty and labor market behavior in the ultra-orthodox population in Israel”, economy and society, Van Leer Institute, Jerusalem. http://www.vanleer.org.il/econsoc/pdf/1_research_mdiniut4.pdf, pp. 1–55. (in Hebrew).